Bitte verwenden Sie unbedingt unsere Programmierrichtlinien ( Coding Guidelines)! Keine Angst, diese enthalten einfach eine kleine Liste hilfreicher Tips & Tricks, und einige einfache Konventionen, die sich als sehr hilfreich herausgestellt haben. When you give your first presentation, my suggestion is: pick one of the documents below, read it, prepare your talk, repeat n times: read the tips again, practice your presentation. For your next presentation, pick another tips document. 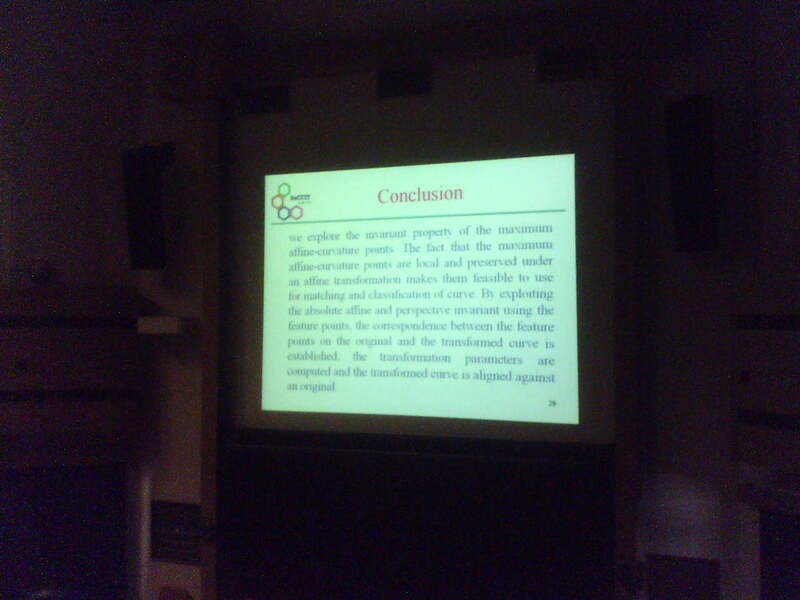 First of all, here is a bad example, taken from a real presentation at a real conference. I cool, and quick video on How to avoid death by PowerPoint by David Phillips, Stockholm. Even though scientific presentations are a little bit different from the kind of presentations he is talking about (business and marketing), the rules he gives can still be applied to scientific presentations, mostly. Here are the Ten Golden Rules for delivering good presentations (in German). Here are some tips on How to Give a Good Research Talk by Peyton Jones, Hughes, and Launchbury; ACM SIGPLAN Notices 28(11), Nov. 1993, 9-12. The part on technology is a bit outdated, but the rest still gives valuable advice. The same goes for the Speaker's Guides for Students by Ian Parberry, University of North Texas. Hier finden Sie einige Hinweise für Seminararbeiten von Prof. Wolfgang Coy, Humboldt-Universität zu Berlin; allerdings stimme ich ihm nicht zu, dass "Der mündliche Vortrag [...] durch Vorlesen eines Manuskripts [erfolgen kann]". Here you can download the PhD thesis of Prof. Dr. Wolfgang Strasser: "Schnelle Kurven- und Flächendarstellung auf grafischen Sichtgeräten", 1974. On the last page, 6-1, in chapter Future Work, he describes basically the Z-buffer. VRIPHYS 2014, GI VR/AR 2014, EuroVR 2014, and ICAT-EGVE 2014. You can purchase the GI-Calendar 2013. For more information click here! Here is one of the last interviews with Joseph Weizenbaum, which I recorded from a radio broadcast (I forget, unfortunately, which program). He was a pioneer in AI and later a critic of mankind delegating too many important tasks and responsibilities to machines.